The Upside Down by itsdanielle91 definitely impresses, collaging together elements from Stranger Things at such strong angles, the viewer’s eye is drawn right into the world it creates. You really feel the grandness of the forest, the stoicism of Eleven, and the danger that the boys are biking into below. The color palette is well-chosen, helping the art to envision a shift from the hopeful blue skies of above to the foreboding, sunset reds of the upside-down. 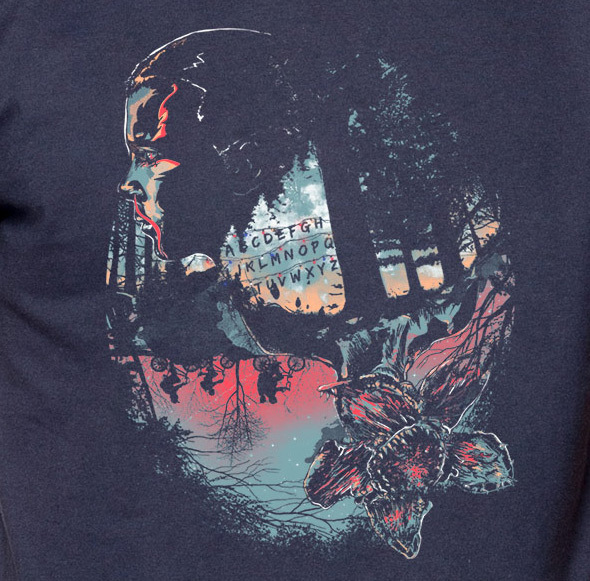 I like the way Eleven and the demogorgon are balanced in position, but the thick trunk of the design’s tallest tree pulls attention towards the creature, giving him extra weight. Angles used throughout keep everything feeling a bit off-kilter, like nothing is truly normal in this scene. It’s very well made, and should be a big hit with fans.